Carnton in Franklin, Tennessee is touted as a "plantation." This label is a bit of a misnomer since the land was used for raising livestock and the food to feed them. Nonetheless, the house has the expansive porch and setting traditionally seen in a plantation. As the site of major Civil War activity, the Civil War buffs (and their screaming rug rats) were lined up in full force. This did not deter the Roadchix. We braced ourselves and got a rather interesting tour of the house that was used as a temporary Civil War Hospital. Throughout the house, bloodstains are still on the floors to the extent that you can see the outlines of the surgeon's footprints and the bloody pool under his "cutting hand." (Roadchick B is a sucker for the "gross out" factor). 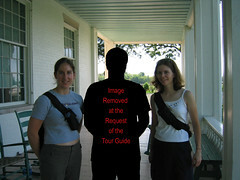 Unfortunately on this tour, the guide was a history snob, and put the Roadchix off a bit. Also, because of our proximity to Nashville and other commercially popular tourist attractions, it was extremely crowded, especially with young children. Note to Roadchix fans, if you ever take your Roadchicklets along on a traditionally "adult" tour, please instruct them not to touch anything unless it is permitted by the tour guide (i.e. : the hand rail going up the stairs). If we all help educate the children (and adults who act like children) on our tours, we WILL make a difference in the preservation of historic artifacts.